The Expo for this race had the best line up I could ever have imagined. It was held at the rather magnificent Grand Hyatt in Poipu, I must say we enjoyed hanging out there for 2 days. We drove over for package pickup on Friday morning, I was so nervous to line up at the 'marathon' section instead of the half. The package included a gorgeous orange technical T-shirt, unfortunately I didn't realize they were unisex so my medium has now been stolen by Kev. Everything came in an awesome shopping bag. The merchandise section was also very well done and we picked up 3 tops, a towel and a hat. It was crazy busy in there all weekend. Then it was time for the best part. 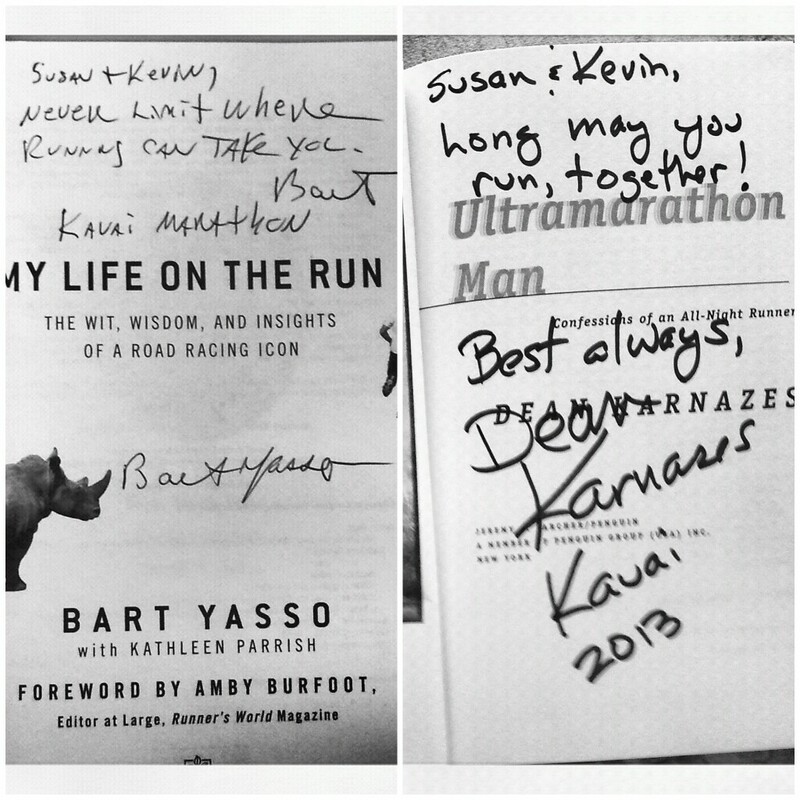 Bart Yasso had a meet and greet at 12, we got our book signed and discussed the race and how to approach it. Agreed strategy: buh-bye Garmin. 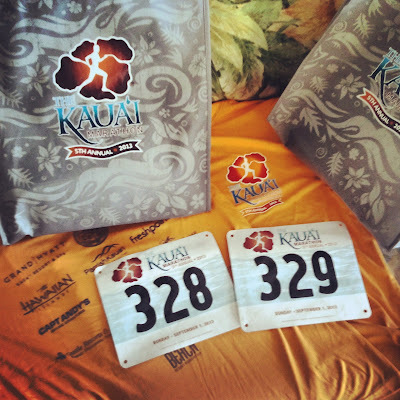 We checked out the weather and talked about running in paradise and how we would hope for rainbows on race day. Bart is awesome. I met Jeff Sacchini, founder of the Kaua'i Marathon and person responsible for the magical course I was about to run. Two thumbs up Jeff! We also met Dean Karnazes on Friday, he's just a bundle of super fit energy. I've read all his books and it was amazing to actually meet him. We talked about heat and Badwater and I asked him to thank Popou for the vanduzzi tip! Dean seemed surprised it actually worked? After that we went to the ballroom to hear Bart talk about the course and show us his running presentation. The slideshow was fantastic, bare buns and burros! We made our way over for 12pm to hear Julie Weiss, Marathon Goddess talk about her journey to 52 marathons in 52 weeks. It was her first ever Powerpoint presentation. Julie is one of the sweetest people you could ever hope to meet. She started raising money and awareness for Pancreatic Cancer research after losing her father. Her talk was heartbreaking and inspiring. Coach Gary Westlund was up next to explain why 'runners & race walkers are smarter than everyone else'. A fascinating presentation regarding brain development through exercise and the importance of staying active as you age. It was another emotional topic. We went back to the Expo room for a meet and greet with Tyler McCandless (marathon winner 2011/2012 and soon to be 2013) and Michael Wardian (marathon winner 2010 & ultra runner). What an amazing opportunity. Mike showed us pictures from a run/hike he had done and both talked about their approach to the race. I can't thank these guys enough for taking the time to do this. Mike is coming back off a crazy injury, 5 stress fractures in the pelvis and 5 hernias. Yikes. Tyler & Newton Running provided 90 pairs of shoes for local kids, talked at schools all over Kaua'i and got kids involved in the first ever Kaua'i Marathon Keiki race. This was such a special race to be a part of, we felt like a big happy crazy family. We chose our first marathon well.